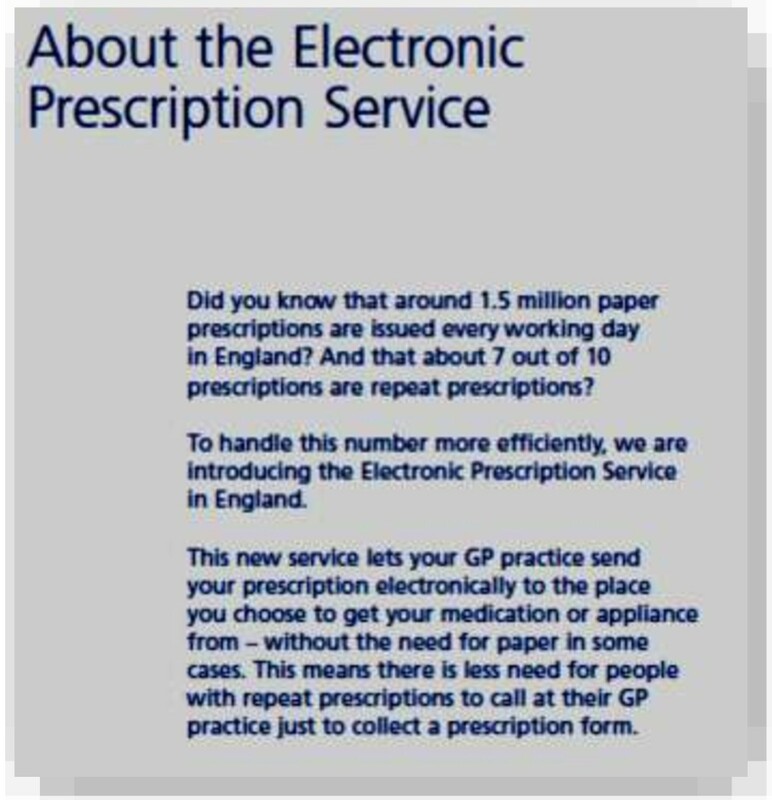 The Electronic Prescription Service release Two (EPS2) is a new national healthcare information and communication technology in England that aims to deliver effective prescription writing, dispensing and reimbursement service to benefit patients. The aim of the study was to explore initial user experiences of Community Pharmacists (CPs) using EPS2. We conducted nonparticipant observations and interviews in eight EPS2 early adopter community pharmacies classified as ‘first-of-type’ in midlands and northern regions in England. We interviewed eight pharmacists and two dispensers in addition to 56 hours recorded nonparticipant observations as field notes. Line-by-line coding and thematic analysis was conducted on the interview transcripts and field notes. CPs faced two types of challenge. The first was to do with missing electronic prescriptions. This was sometimes very disrupting to work practice, but pharmacists considered it a temporary issue resolvable with minor modifications to the system and user familiarity. The second was to do with long term design-specific issues. Pharmacists could only overcome these by using the system in ways not intended by the developers. Some felt that these issues would not exist had ‘real’ users been involved in the initial development. The issues were: 1) printing out electronic prescriptions (tokens) to dispense from for safe dispensing practices and to free up monitors for other uses, 2) logging all dispensing activities with one user’s Smartcard for convenience and use all human resources in the pharmacy, and, 3) problematic interface causing issues with endorsing prescriptions and claiming reimbursements. We question if these unintended uses and barriers would have occurred had a more rigorous user-centric principles been applied at the earlier stages of design and implementation of EPS. We conclude that, since modification can occur at the evaluation stage, there is still scope for some of these barriers to be corrected to address the needs, and enhance the experiences, of CPs using the service, and make recommendations on how current challenges could be resolved. Patient to General Practitioner (GP): GP (or designated prescriber) writes prescriptions electronically. Electronic prescription to Spine: The electronic prescription is sent to and stored on a national database called the N3, commonly known as the Spine. (CP professionals) in pharmacies nominated by the patient to dispense their prescriptions can access and download the prescription from the Spine, and dispense it to the patient. Community pharmacies to remuneration agency: The remuneration agency, formerly known as Prescription Pricing Authority (PPA), is now called NHS Prescription Services. NHS Prescription Services receives prescriptions from dispensers, such as community pharmacies, calculates relevant payments for the items dispensed and remunerates dispensers for these. With EPS2, details of items dispensed are sent directly to NHS Prescription Services electronically. Therefore, prescribers, dispensers, patients and the pricing authority are key stakeholders in the successful implementation of the EPS2. Figure 1 shows the original EPS2 architecture given to the study team by the initial overseeing body called Connecting for Health (CfH). While the wider scope of the research project was to evaluate changes in various forms made by EPS2 to all stakeholders, in this paper we focus on community pharmacies. CP professionals were proposed to be one of the key beneficiaries of the EPS2 for being able to provide a better quality service because of improved work practices. The pharmacist from the first adopter pharmacy began dispensing EPS2 prescriptions in July 2009. Although EPS2 was still undergoing development at the time of data collection (February–September 2011), early adopters were dispensing between 10% and 40% EPS2 prescriptions (Table 1). Original EPS2 model and architecture (given to study team by Connecting for Health). Since 2011, the National Health Service (NHS) in England, including EPS2 has been undergoing re-organisation. EPS2 was originally part of the National Programme for IT (NPfIT) to make Primary and Secondary care electronically interoperable in England , but it was designed to operate independent of other NPfIT programmes [2–5]. When NPfIT was dismantled in 2011, some of its stand-alone programmes such as EPS2 were retained. On 31 March 2013, the overseeing body of the NPfIT programmes CfH ceased to exist. Many of its functions, including the Electronic Prescription Service, have transferred to the new Health and Social Care Information Centre (HSCIC). On 1st April 2013, responsibility for supporting pharmacists in using these services transferred to NHS England (formally known as the NHS Commissioning Board) . The EPS2 national implementation programme is still on going. The aim of the study was to explore initial user experiences of CP professionals, and to ask if their needs were met concerning the development and implementation of EPS2. In the following, we briefly discuss key factors in new technology adoption and frame our research questions within these contexts. We then discuss our methodology, present and discuss our findings. Please note that we use ‘early adopters’ to denote sites involved in the early stages of EPS2 implementation. Also, note that we use the term ‘real user’ to denote actual users of the system. In this paper, ‘real users’ are practising community pharmacists and their teams, and not any other type of pharmacist. New systems or innovations are usually developed to solve a problem or aid a process. A system development usually comprises several iterative stages in its lifecycle such as specification or problem-definition, feasibility study, analysis, design, implementation, evaluation and maintenance. When a new system is being developed, many factors influence the planning stage . Key factors include: a) Financial aspects, which comprise of the cost of the system and the overall benefits. b) Technical aspects, what can be accomplished by using existing technologies? and c) Social factors, which comprise changes the new system will be making to current work practices of the users, and how users will engage with the system comprehensively. Some authors recognise this last factor, the social factor, as the most important in a system development concerning the systems acceptance and diffusion [8, 9]. Rogers, for example, names five determinants including simplicity and ease of use, and, compatibility with existing values and practices as key factors in successful adoption, and argue that the innovation is usually what changes to suit the user and not the other way round . Many systems fail or fall into disuse not because of technical failure, but in how the technology is matched to the social environment . The disengagement by users, or a poor user experience directly affects financial and technical factors and can render the system unusable and detrimental [11–15]. Consequently, there needs to be a continuous engagement between the system and the social environment to render a product usable . In theorising the role technology plays in social structures, Greenhalgh and Stone  explained that, the technological component of social structures may be supported when people choose to use the technology, and, not supported when they actively refuse to use it or, importantly, cannot use it at all or in the ways they would like. In healthcare, Benn et al. lists “size, regional location, internal structure, management processes, history, external regulatory environment, culture and leadership” as key variables that contribute to successful delivery of care systems. However, similar to other theories, emphasis is placed on social elements as a key factor in technology adoption. Harvey et al. for example conceptualised that “socio-technical interdependence” is a key dimension in the adoption of new technology into pharmacy work practice. Therefore, before new technology is effectively integrated into work practice, it is important to note how the intended users interact with existing technologies in that environment. In their study, which focused on the approaches to, and experiences of user engagement of the adoption of Lorenzo software into national EHR system in England, Cresswell et al. placed emphasis on user (dis)engagement. For example, because real users such as hospital staff were not included in the system development process, this alienated them during the implementation process as they felt the system was then not sufficiently customised for their needs. Furthermore, Gagnon et al. found that the boundary between barriers and facilitators in electronic prescription systems’ adoption were blurred, and recommended studies to be conducted from a variety of user group perspectives. Within these contexts, we frame our research questions: what were CP professionals’ experiences of EPS2, what were their perceptions and attitudes toward the new system, and what can be learned to improve user experience and feedback to the implementers in terms of meeting their needs? The research was part of the national CfH evaluation programme commissioned by Department of Health to evaluate how EPS2 will alter work practices. The research protocol was designed by a multidisciplinary study team consisting of social scientists, academic and practising pharmacists and a general practitioner. The methodological framework was developed from literature reviews on ‘user perception’ studies of new technologies [21–23], electronic prescription adoption in healthcare [24–29] and listed potential benefits of EPS2 according to CfH . Rather than using standardised variables in ‘user perception’ study models such as perceived ease of use and perceived usefulness, we adopted a constructivist (qualitative) approach by using flexible themes based on user-perception studies, such as user’s perceptions on positive and negative issues, perceived benefits, and opinions on removing the system. This approach allowed us to delve deeper beyond standardised variables into users’ candid perceptions. The data were collected between February and September 2011. In terms of sampling, we obtained a list of pharmacies classified as early adopters from CfH and selected pharmacies that were ‘live’ and dispensing above 5% electronic prescriptions. The eight pharmacies that fell into this category were in the midland and northern regions of England (Table 1). 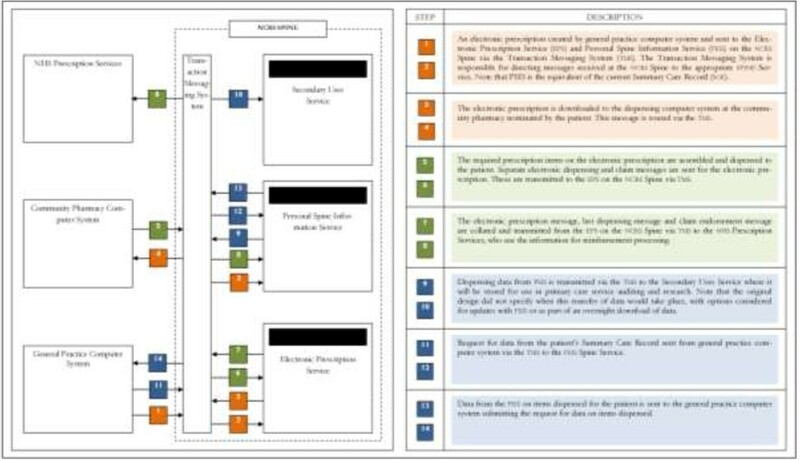 Sites with different computerised pharmacy management systems were chosen to get divergent perspectives. Other variations in the sites sampled included type of ownership of the pharmacy (independent or chain), geographic location and different software suppliers. Due to the small number of test sites (initial adopters) at the time of the study, providing detailed information in this paper would breech confidentiality and commercial sensitivity agreements. Permissions were sought from approval bodies at each of the study sites, including Primary Care Trusts, research governance teams, benefit realisation teams and informatics leads. The study protocol was submitted to the Cambridgeshire Research Ethics Committee who classed the study as a service evaluation. Data were collected using ethnographically informed mixed methods including observations, formal (recorded) and informal interviews, and shadowing of pharmacy professionals. Our chief participants were pharmacists/pharmacist proprietors as they had overall insight of the EPS2 integration into work practice. We conducted audio-recorded interviews with all chief participants. We also audio-recorded one accredited checking technician and one dispenser as additional participants. We conducted 10 audio-recorded in-depth interviews. The interviews took 30 minutes to one hour, with transcripts for each averaging 3700 words. Notes were recorded from the participants too occupied with work to give audio-recorded interviews. While the pharmacists were generous in allowing us access to their sites and permitting interviews, the busy nature of the job meant there were time constraints. Overall, 37, 200 words from the transcripts were analysed besides the field notes. Both types of qualitative data were analysed using line-by-line coding (Figure 2) and thematic analysis. Each line was coded into subthemes and into themes. Themes were then recoded into positive and negative issues. This identified experiences associated with usability and user experiences thereby achieving a bottom-up analysis. EPS is a standardised system that has to be integrated with different pharmacy dispensing systems, meaning CPs have a choice of who their ‘pharmacy system-EPS’ supplier is . The eight sites had different pharmacy system suppliers. Bearing this in mind, we focused our analysis on common issues among the sites to remove supplier specific issues. Analysis showed that CP professionals were overall positive about the system and wished for it to be retained and improved, instead of being discontinued . They were however facing two types of challenges with the system. The first type of challenge was caused by missing electronic prescriptions. Sometimes, when the prescriber wrote the prescription, pharmacists nominated by the patient to dispense the prescription could not see or download the prescription for dispensing. This issue was especially challenging for pharmacists as there were different causes with no adaptable solution within pharmacy work practice. Pharmacists, however, considered this a teething issue that could be resolved by small modifications to the system . The second type of challenge was considered long-term and was specific to the system design. Although these design specific issues were adaptable into work practice with ‘add-on’ designs, pharmacists thought these issues were present because they were not involved in the system design and development. We decided to present the two challenges in two papers to allow us to discuss the issues (with user commentaries) in detail. In this paper, we present our set of second type challenge in the EPS2 adoption. We found there were some essential user needs that were not met. These caused users to interact with the system in ways not intended by the system developers, and interfered with how CP professionals experienced the system. These were, 1) dispensing from printed-out tokens instead of screens, 2) using one Smartcard to log all dispensing activities by different staff, and, 3) problematic interface for claiming reimbursements. NHS EPS2 patient and carers information leaflet in England. I don’t know whether their initial aim was to dispense off the screen or check off the screen, you know, but I wouldn’t check off the screen or dispense off the screen at all. I need a piece of paper in front of me, so that defeats the purpose of the electronic prescriptions” (Site 3, Pharmacist). “Often, you are too busy in a pharmacy to be able to dispense from the screen. You might have to run your labels off and you need something to check from” (Site 1, Pharmacist). “I don’t ever see—I don’t know if you could ever get rid of the paper aspect, because I think that I wouldn’t like to check three prescriptions of five items, fifteen items looking at a TV screen. I think I would end up kind of cross-eyed. It’s much easier to look at a piece of paper” (Site 8, Pharmacist). “You might need the token to be able to check your items to the labels. Also, you need the repeat slip for patients attached to the token. Patients aren’t going to be able to order again unless they get something in their bag and they can order next time. To do that you need to print the token. If the patient is exempt in some way or pays for the prescription, it has to be filled in on the back if they are not age exempt. If they are under 16, or, over 60, you don’t have to use that paper copy. However you still need the repeat slips, you still need to fill in the exemption and get it signed on the back to show that the patient has an exemption or has a certificate to show that they don’t pay” (Site 1, Pharmacist). On 10 October 2012, E-health Insider (EHI) featured an article that showed plans for the NHS to be paperless by 2015 . From these interviewee commentaries, it is apparent that the paper-free design of EPS2 is challenging to its users in practice. Paper prescriptions are small, light and mobile and can be annotated, for example, in the final safety check the pharmacist can tick each item on the paper as it has been confirmed correct, allowing them to be interrupted and regain their place without losing accuracy. Perhaps other ‘paper-free’ alternatives could be explored such as using tablets to take screenshots of the electronic prescription for portable dispensing. A challenge in relation to printing of tokens is the additional cost; that pharmacists take this on without reimbursement shows the printing has value to them. “We do all have individual Smartcards. We all can use an individual Smartcard. It would just tend to be whoever has been logged in first thing in the morning as the person who would end up doing that most of the day. S goes home at half past four, for instance, and then someone else would have to do it. SE would probably log-in, she leaves at six and then whoever is in this evening would log-in. It just depends really as to who is in first thing in the morning. But yeah, that’s just the way it goes” (Site 5, Pharmacist). “No, we should do [log-in individually], but we don’t. Because three dispensers, well three people, have the Smartcard in the pharmacy and in fact there is probably five people in the pharmacy that can do all of the jobs and if we kind of religiously stuck to the Smartcard [rule], two people would be isolated away from the computer not being able to dispense. I log-in at the beginning of the day and it’s left there. My responsibility if anything happens untoward, but I can’t understand what it could be, because they are doing NHS prescriptions all the time anyway, and they are used to doing that, and they’ve signed the Data Confidentiality and Data Protection Act” (Site 8, Pharmacist). “We keep our own. We’ve [each] got a screen, a monitor each, maybe because there is only two of us so X keeps her Smartcard and if I’m not in and if there is a locum in, X will download all the prescriptions, because well, our regular locum does have her own Smartcard and she will bring that and use that. But if you use an agency locums, they wouldn’t necessarily have a card and then everything would go through X” (Site 6, Pharmacist). Clearly, this was not how the system was designed, continued use this way could breach security and might become an issue if pharmacists have access to patients’ electronic health records. Since EPS2 is still undergoing product development through modifications, perhaps this feature could be modified in a way that would not require the logging of every user’s activity. “NCSO means No Cheaper Stock Obtainable. Normally everything gets endorsed by the computer, by the endorsing machine. Certain items have to be endorsed manually [not automatic but completed on screen] if it’s specialised and controlled drugs or NCSO. Every month, the Department of Health, they produce a list. Sometimes it’s quite a big list, ten, fifteen items and sometimes it’s only one or two items. For example, this month, 20 mg tablets is on the NCSO list. That list only gets published about the tenth of each month. Everything I’ve done from the first to the tenth, I don’t know whether that item is going to be on the NCSO list. With NCSO, what I have to do, I have to sign it, and I have to date it and I have to put the price I’ve paid for it. So the (Inaudible 00.12.22) might be £2.50 for example. What I’ve paid for it is £10. If I can’t endorse it as £10 I lose £7.50.” (Site 3, Pharmacist). “We are still having problems transmitting a lot of data to pricing bureau. Last month, I think we had about two dozen in total that wouldn’t allow them to be electronically submitted. Our main problem is, when you come to do your ETPII endorsing on [software system 2], I think it was the same on [software system 1]. If you supply, say aspirin tablets and you say aspirin tablets and it has a manufacturer next to it Tabba Actevis. What we’ve done is, we’ve obviously ticked the NCSO button. Because we’ve logged in, we assume that’s as good as a signature for them, which it is, apparently and we sent the data off for months and months and months. We haven’t been paid for any NCSO for months” (Site 2, Pharmacist Proprietor). “When we endorse, often there is prescriptions that just won’t go. They won’t send so we’ve [wrongly] paid for numerous prescriptions where I’m going to have to sit down with X from the PCT [Primary Care Trust] next week and go through them all and see whether we can chase these payments. Some of them are over six months old, so then we’d have to request the doctors to reissue. One of the endorsing issues was for PIs imports that should get paid the same as a normal English pack. The C programme was asking for a supplementary payment, which is not required for this item. But because I’ve spoken to pharmacists who work in a pharmacy and obviously [they’ve] spoken to a pharmacist who has been stuck in their computer room for the last ten years, they don’t realise what’s going on. They basically said to us, well, for it to go you need to put a payment in or a supplementary payment. They said, well, just put a penny in and they will pay you for the right amount. Some of these cost a lot of money. I said well, I tell you what then, if they are going to pay the right amount, why should I put a penny in and risk it. I’ll put £10,000 in shall I, and then I will get paid still the right amount and not the £10,000. If it goes wrong, I’m at least on the right side of it. So then I get the PPA ringing me up and wondering why I’ve endorsed a load of prescriptions for millions of pounds and then again I’m under stress again, because the PPA are accusing me then of trying to claim lots of money, I was just trying to prove a point” (Site 1, Pharmacist Proprietor). These detailed commentaries define an interface problem that appears to be causing monetary stress to some pharmacists. Since the interface was not user-friendly, users had to look for alternative ways to claim reimbursements of NCSO items. In our findings, CP professionals’ needs were not met, particularly in how the system was designed so they had to find ways to adapt them to their needs. The usability and user experience issues identified did not conform with key facilitators of technology adoption such as ease of use and compatibility [9, 38]. While an explanation of the unintended uses could be attributed to CPs collective resistance to change, it does not appear as if the system was tailored to their needs in the first place, which is a key facilitator of technology adoption. A different explanation to these design specific issues could be due to the lack of CPs’ perspectives in the design and development of the EPS2, as demonstrated by this comment: “But because I’ve spoken to pharmacists who work in a pharmacy and obviously [they’ve] spoken to a pharmacist who has been stuck in their computer room for the last ten years, they don’t realise what’s going on”. Whether or not this statement is justified, in the following, we use the concept of user-centric principles to explore and discuss how the involvement of CPs as a key user group in the EPS2 development might have enhanced their experience. To meet user needs in terms of system design, users are often involved in the system development process . Applying user-centric principles, such as user-centred design, which moulds the design of the system to suit its intended users, is recognised as best practice . Studies have shown that national healthcare Information and Communication Technologies (ICTs) development such as Electronic Health Records (EHRs) tend to fail in user engagement . A key reason for this is, users tend to be excluded from the initial stages, and are usually involved only at later stages, thereby making critical modifications to the system design either expensive or impossible [40–42]. Integrated design that involves the system, the work practices, online-help, training, organisation, etc. The theory about the application of these principles is that they will improve the usability of the product and its User Interface (UI) such as ease of use, efficiency, reduced error, and user satisfaction. UI has especially become a current focus of UCD practices as it enables users to familiarise themselves with the product’s interface early . When detailed iteration takes place in the later stages of the development, it is more expensive if the design follows a stage-gate model from conceptual to detailed design. Meaning each design step sets constraints on the next and hence any change in design at a later stage is more expensive than at an earlier stage . Using this perspective, we put into context how a UCD approach could have been used to mould CP professionals’ experience of EPS2. While reasons such as lack of technical and other forms of support, no added value in terms of finance, or even resistance to change could be explanations for why CPs could not interact effectively with the design of EPS2 [9, 20, 38], active user-involvement could be another explanation. Firstly, in terms of dispensing directly from screens, CPs elected to print and dispense from tokens because various usability requirements such as equipment sharing, job sharing, multi-tasking, and providing advisory slips to patients made dispensing directly from screens challenging. This issue was evident during the piloting of various models at the concept evaluation stage . However, it appears the issue was not explored further or resolved before latter stages, as it would have also been evident during the prototype testing stage. Secondly, in terms of CPs electing to use a single smartcard for multiple users, a key practice of UCD is to perform detailed task analysis of users’ work to design systems that would improve (not interfere) with workflow . Using multiple user log-ins to achieve accurate audit trails appears a feasible concept. In practice however, the concept was challenging for CP professionals as it interfered with workflow. They therefore adapted the Smartcard’s usability to suit their needs by using one Smartcard to serve multiple users. This issue was evident in our EPS2 pre-implementation study of pharmacy work practice as pharmacists showed signs of not using EPS2 Smartcards as intended. We fed back our findings to participating PCTs as part of our formative evaluation . However, this issue could have been evident much earlier at the concept evaluation stage when the idea of EPS2 (and this function) was being marketed to users. It could also have been identified during the user’s task analysis or even the prototyping stages of user-centric approaches. Lastly, since a common user interface to integrate with different types of pharmacy managing systems was not developed, pharmacists had to find ways to deal with the NCSO claiming and endorsing function. Prototype testing by users from various dispensing systems could have aided a better NCSO UI design across all systems. We do not know to what extent user-centric approaches were used and how rigorously they were applied as we could find very little information on this. It is possible that these design issues were identified at earlier stages but were not resolved at later stages of the system development, however, the purpose of active user involvement is to mould the system to user needs before it becomes too expensive to resolve . While, there may be other explanations for why users could not integrate these EPS2 features into work practice, our study suggests that lack of active CP user groups in the early stages of system development may have been the main problem. While engaging users at later stages allows them to touch and feel the actual product and not just a concept, active involvement in the initial stages is more participatory and allows users to contribute to the design based on their needs. The EPS2 at its evaluation stage clearly showed some important technical barriers that could have perhaps been eliminated had real users been meticulously and actively involved in the initial stages of its development. We have built on work done by Cresswell et al. on user engagement by focusing on community pharmacists and their teams as a key user as key user group in the delivery of the national Electronic Prescription Service (EPS) in England. Our focus on English community pharmacies (and primary care) in this paper contributes new knowledge because most of the user-perception literature on national electronic prescriptions systems relates to other parts of Europe and America, and focuses on general practice (GP) or secondary care [20, 24–29]. We emphasize that these are only preliminary findings from early adopter sites, and suggest further studies to establish how the system operates when more mature. We acknowledge that with a small sample our findings may not be generalisable to other community pharmacies, or fit with the experiences of pharmacies that adopted EPS later. However, our aim is to draw attention to involving user group perspectives into systems’ development regardless of whether the issues were still persistent at the time of writing this article. Overall, there is scope for further studies once EPS2 has been implemented more widely. This could help determine whether issues we have identified have been resolved and/or whether new issues have emerged. Using detailed commentaries from the study of early adopters, we have drawn attention to some key issues in national healthcare system development from a community pharmacy perspective. Firstly, pharmacy professionals needs were not meet in terms of the system design as they had to appropriate certain aspects of the system to suit their needs. Secondly, the process of involving users should be made publicly available to reassure users and to make the development process transparent. Thirdly, our findings suggest that involving real users in the service or system design from the initial stages and throughout the development life cycle could help enhance usability and user experiences, or at least flag up cases in which national policy will be detrimental to local activities. 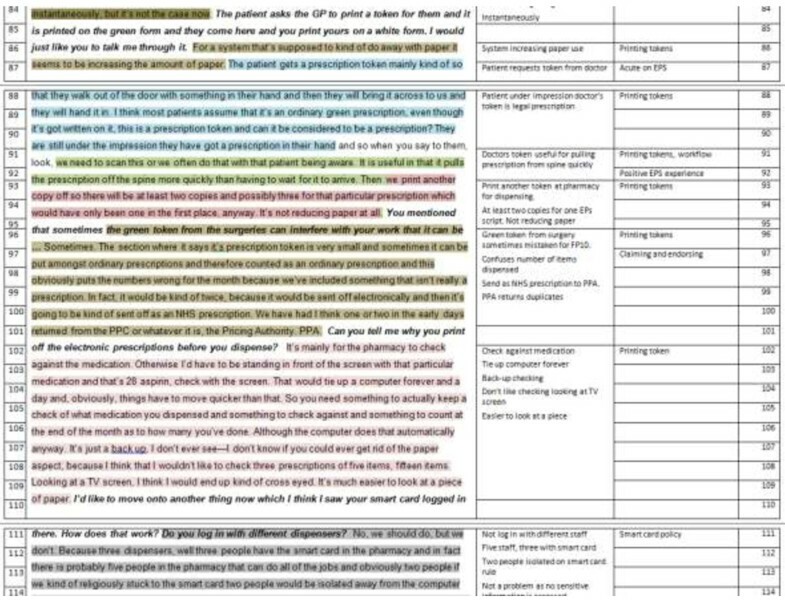 While we acknowledge that many pharmacists were over all in favour of the system, EPS2 at this early evaluation stage clearly showed some key usability and user experience barriers that could have perhaps been eliminated had real users been meticulously and actively involved in the initial stages of its development. We conclude that since EPS2 at the writing of this article is in its evaluation stage, these issues can still be addressed through modifications and perhaps system redesign, and would help meet the needs of community pharmacies and improve their user experience. Our recommendations take into account that the EPS is still evolving, and therefore need long term (or futuristic) solutions to the design challenges faced by pharmacists, if a paperless NHS is to be achieved. Paperless alternatives to the prescription should be developed and assessed with users. Alternative governance arrangements, or different technology (such as biometric identification), is needed to allow several different users to use the same terminals without delay. In terms of interface challenges of claiming and reimbursement, pharmacists could be encouraged to make NCSO claims, after the list is published by the Department of Health, while EPS is evolving. In the long term, we recommend that pharmacists make their collective voice heard regarding this issue so that a more acceptable ‘standardised’ interface could be achieved. Pharmacists should form powerful user groups to work with each of the pharmacy management system suppliers. JH is a social scientist and specialises in Social Informatics, in particular, ethnological study of peoples’ (dis)engagement with technologies. She has a multidisciplinary background in human sciences, information science and information technology. She works with Professor Tony Avery at the School of Medicine, University of Nottingham. JH previously worked at the Department of Social Sciences, Loughborough University, and WMG at the University of Warwick. AA is professor of Primary Health Care at the Division of Primary Care, School of Medicine, University of Nottingham. Among other interests, he specialises in patient safety and the use of information technology to aid clinical practice, and has an extensive portfolio and high starred academic papers for both quantitative and qualitative research in this field. AA is also an active general practitioner in the city of Nottingham. RH was a Research Fellow at the Department of Practice and Policy, University College London School of Pharmacy, University of London. RH has a background in technical design and engineering. His position as the lead researcher of the EPS2 project enabled him to gain critical insight into EPS2 development as he has access to implementer and user group meetings and, liaised closely with Connecting for Health. NB is professor of the Practice of Pharmacy at the Department of Practice and Policy, University College London School of Pharmacy, University of London. NB gave a critical insight throughout the research write up. NB is also a visiting professor of medication safety at Harvard Medical School and is a practising pharmacist. We thank all the pharmacies that took part of the study despite having a lot to grapple with. We also thank the individuals from Connecting for Health and the technical architects who gave us insights into EPS2 planning and development. We thank the informatics leads from the Primary Care Trusts who allowed us access to these early adopter sites. Finally, we thank the wider project team for their feedback in the analysis and interpretation of the results. This report is independent research commissioned by the National Institute of Health Research. The views expressed in this publication are those of the authors and not necessarily those of the NHS, the National Institute for Health Research or the Department of Health. The authors declare they have not competing interests. JH facilitated the refinement of the research design, was the primary data collector of the study. She conducted the in-depth interviews and recorded the nonparticipant observations field notes from all eight early adopter pharmacies. JH conducted the analysis and interpretation of the data with AA and NB and other members of the team, and led the writing of this paper. AA co-authored and edited all the cases studies from the study, extensively contributed to the analysis and the interpretation and of the data and provided commentary on the writing up process. RH provided insights into user group involvement in the EPS2 planning and development by interviewing the relevant technical architects and making available user group meeting minutes. RH also provided constructive feedback on this paper. NB contributed to the analysis and critical interpretation of the data analysis and provided key insights to improve the paper. All authors read and approved the final manuscript.